it is said the best roads in Oregon are in Washington. at least I think i heard someone say that once. I'm not sure who coined it, but to a certain degree this idea holds true. 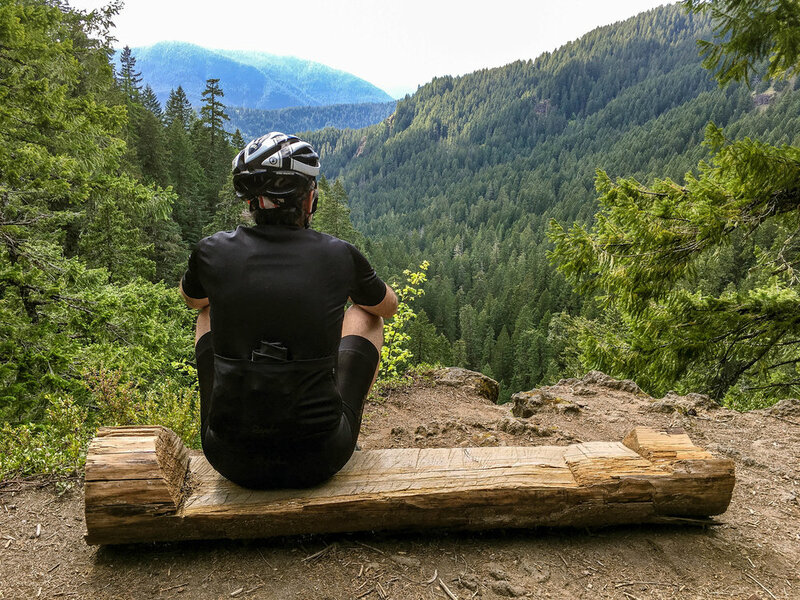 the Gifford pinchot national forest is a veritable wonderland of dense forests, remote valleys, epic vistas, complex topography and volcanic peaks spanning the southern cascades from mount rainier to the columbia river gorge. Encompassing 1.32 million acres of old and second-growth forest, the Gifford Pinchot can be somewhat intimidating in terms of size and scale. Contained within are 8 designated Wilderness areas, 7 major river systems, 21 major lakes, 2 monster stratovolcanoes (St. Helens and Adams), a third volcanic behemoth to the north (Rainier) and the largest roadless area in western Washington, the Dark Divide. The Wind River corridor north of Carson makes for an accessible entry point into the Panther Creek, Soda Peaks, Falls Creek, Grassy Knoll, Trout Creek and Wind River Experimental Forest areas. In the southern Gifford or more specifically, the Mt. Adams Ranger District alone, there are literally hundreds of possible routing combinations, which presents a unique challenge in that pinning down any one loop as finished or final and calling it a definitive route will never really do this type of area justice. It seems to make more sense to approach the Wind River area as its own bite-sized region and simply outline some of our favorite roads and go-to loops, most parts of which can be mixed and matched to configure longer, shorter or different versions of your own adventure. We'll start with the individual components of the Falls Creek Hinterland routes. 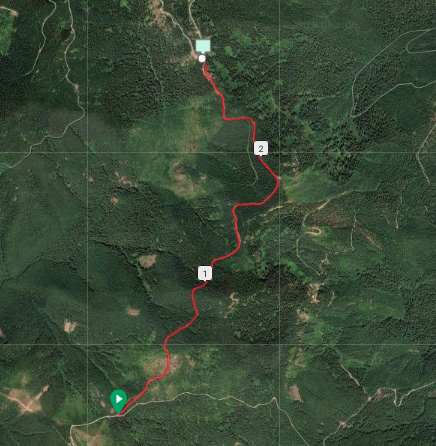 National Forest Road 68 is an epic, sweeping climb/descent sequence connecting Bear Creek Road/6808 to the heart of the Panther Creek area. We have historically used the 6808>68 loop as the front end to each of the Falls Creek Hinterland routing options. From Wind River Road, 68 begins as ‘Bear Creek Road’ before turning to gravel. The 6808>68 loop snakes 28 miles and climbs roughly 3600 feet crossing the PCT and the Grassy Knoll before terminating into Panther Creek Road (NF65). The gradients are gentle, the surface is what some folks refer to as 'luxury gravel' and the breakout views are classic Gifford. We highly recommend putting this one in the mix. 6801 is a decommissioned stretch of forest doubletrack linking 68 to 60 (Carson-Guler Road) that essentially parallels Panther Creek Road allowing a much wilder, more remote and car-free option to the upper Falls Creek area. Best ridden from south to north, 6801 is in a state of gradual reclamation by nature, with quite a bit of posthuman flavor, somewhat overgrown and intercut by two severely washed-out ravines which will require some minor bike portage. These culverts provide a good opportunity to get out of the saddle, filter and refill water. Nearing the intersection with Carson-Guler Road, 6801's tree-tunnel broadens into more or less a standard gravel road. One thing to keep in mind in the shoulder seasons is that 6801, like many other roads up here, is impassible by vehicular traffic and tops out at 3400 feet, so snow will tend to accumulate and stick around longer than other areas. Falls Creek Trail is a great CX-accessible singletrack connector from the 65/67 zone up near the Falls Creek lava caves back down to the Wind River area. It is predominantly classic, smooth wooded singletrack with only a few rooty technical bits in the upper areas. There is a relatively new 3 mile NWTA section up top leading off of 67. The other option for accessing the trail is an older patch of rocky forest road, which tends to be a bit jarring for some. There are some wonderful vista points around mile 5 overlooking Falls Creek falls. Be aware from mile 5 onward that this lower section tends to get a fair amount of hiking traffic, so be courteous and accommodating. One nice aspect of Falls Creek is that it gets less technical, faster and more dramatic the lower you get, snaking along steep hillsides and drainages down to the bridge over Falls Creek around mile 7.4. A left off of the bridge winds around to the Falls Creek trails parking area. NF3062 is a dusty stretch of potholed gravel leading back to the Wind River Highway. Expect a fair amount of car traffic on high season weekends. 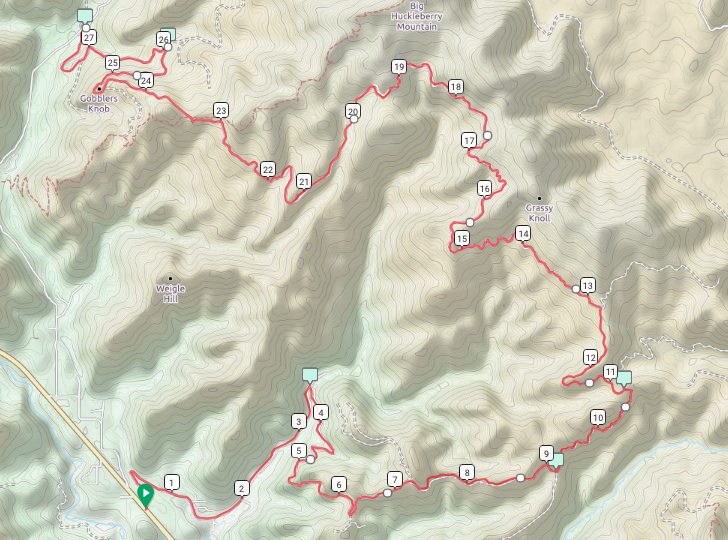 Lower 65 or Panther Creek Road is a simple, efficient paved thoroughfare connecting the Wind River Highway to the 'four corners' intersection with 60/Carson-Guler Road and points further north like the Falls Creek and McClellan trailheads. It can be a useful front-end utility connector to climb straight to the good stuff or as a quick beeline descent back to Carson. 41 is an absolute diamond in the rough. Running through the heart of the Trout Creek parcel of the Wind River Experimental Forest, 41 is a dramatic illustration of mother nature's powers of regeneration. The east end of 41 is also called 412 or Sunset Hemlock Road, but don't let the official-looking lines on the map fool you, lower 41 is tangly, overgrown and quite literally a glorified gametrail in many places. That said, the gradients are exceedingly gentle and its orientation along Stevenson Ridge provide fantastic access to 4220, Cougar Rock and points north. 41 climbs west out of the back of the old Wind River Arboretum facility through a fair amount of deadfall and debris, gradually narrowing to several miles of singletrack along Stevenson Ridge before broadening back out into primitive forest road around the trail intersections with Sedum Ridge and the PCT. 41 continues westward beyond 4220 to the Sunset Falls area, however our overview here only pertains to the 11.5 mile section east of 4220. 41 is great in either direction, though because of downed trees and snags, as a climb, it can be a bit time-consuming. As with 6801, 41 is impassible by car, so again will have snow sticking around much later in the season than roads open to vehicular traffic. Referenced alongside the most premium roads in the Gifford, 4220 is a short, dramatic 2.8 mile north-south stretch of heaven linking 41 with 42, providing some of the best breakout views in the southern Gifford. 4220 approaches the iconic Cougar Rock intersection from the south making it a hub from which some of best roads in the area radiate. Cougar Rock is a jump-off point to any number of loops including forest roads 42, 34, 37, 53 and 54. 42 is a rather civilized bit of well-maintained dirt road connecting the pavement of lower 54 with Cougar Rock, the east fork of the Lewis River, Sunset Falls and beyond. 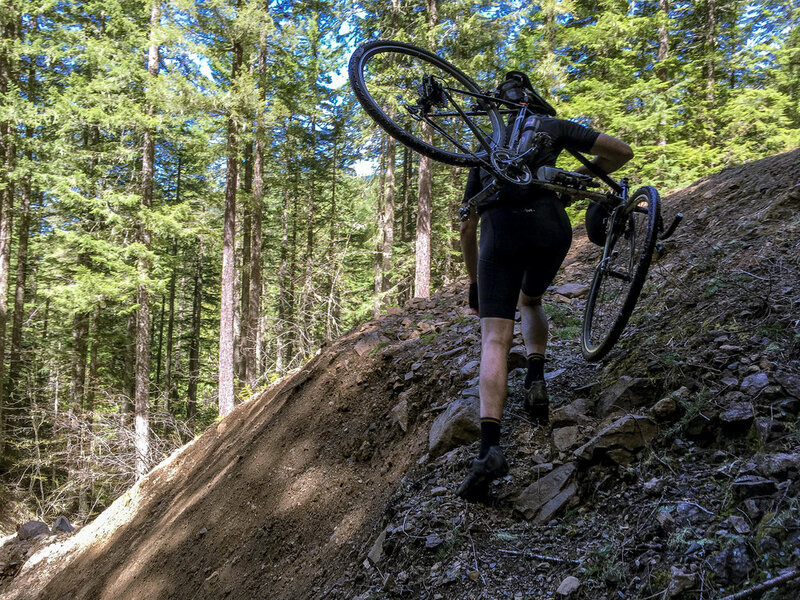 With a max gradient of 9.3, the climb to or descent from 4220 via 42 is nonchalant enough to be considered one of the gentler ways to Cougar Rock. Lush deciduous forest down below with plenty of water options via Pass and Trout creeks, 42 winds through closely-set tunnels of dense evergreen before breaking out of the trees beneath dramatic rock outcroppings and stunning valley views. If 42 is the civilized way up to Cougar Rock, we will consider 43 the cheap and dirty version. Much less desirable as a climb, but nonetheless useful to know about mostly for what it offers as a potential descent. Connecting upper 41 to Trout Creek and Wind River arboretum areas, NF43 begins as 417 off the Wind River work center out of Stabler. 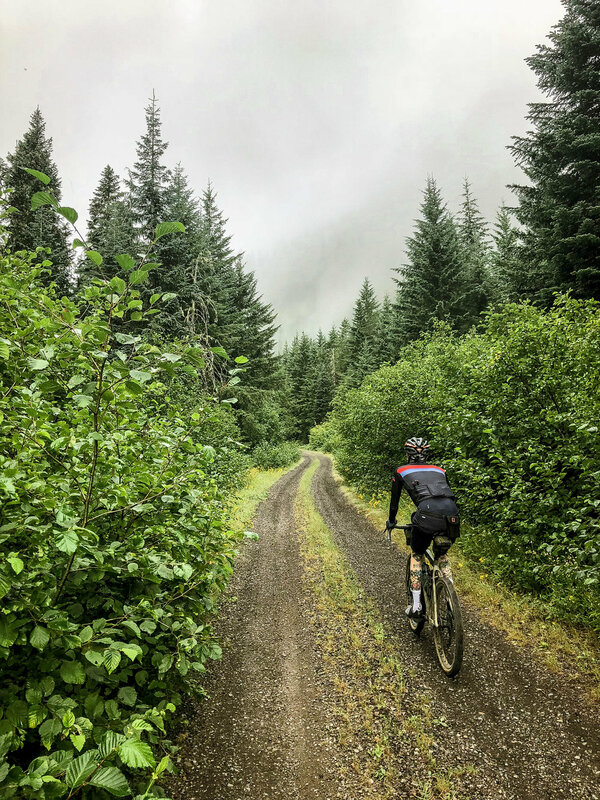 It lollygags along Trout Creek without gaining much in the way of elevation until the last two or three miles, which averages between 10-14% over loose, difficult logging chunk. Not the most enjoyable way up, but conceivably useful as a more efficient straight-shot connector back down in lieu of lower 41. NF53 is the westernmost spur off of Cougar Rock which dives deep into the shady recesses of Canyon Creek, dropping 2400 feet over 10 miles as it winds toward its connection with NF37 and subsequently 54. 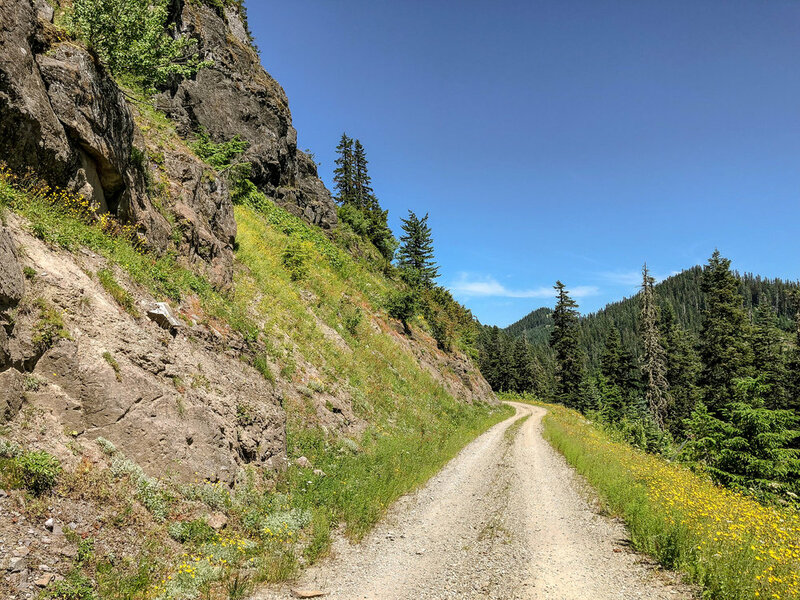 Beginning as a gravel road near Cougar Rock, 53 alternates between exposed embedded rock, mossy doubletrack and cracked, crumbling mossy pavement from a bygone era. This is a descent to take cautiously as there are several washouts, sunken grades and uneven depressions in the disintegrating asphalt. Also note that it sees little to no traffic, so is a fairly remote stretch. Additionally, the valley of Canyon Creek tends to hold in quite a bit more microclimatic moisture and rain than the surrounding areas, so expect mossy, green and drippy-drops down below. NF37 is a gamey slice of remote adventure. Oriented in a NW-SE direction, NF37 stretches from its intersections with 53/54, climbing 2800 feet out of Canyon Creek, hugging the south side of the valley, to intersect with any number of higher connectors such as 42 or 34 en route to upper NF54. Significantly more remote and rugged than 53, 37 has several washouts rendering it impassible to vehicles, creating the effect of having been forgotten by time. The road narrows down to singletrack in several places due to the encroaching tree-tunneling vegetation. This one is a delightful stretch if you have the time, but due to its rather isolated location, requires a bit of commitment. NF34 is a short, pleasant, relatively nondescript stretch connecting 37 to 54 near the Soda Peaks Trailhead intersection. 34 is noteworthy primarily because it acts as a utility conduit between 37, 54 and 42 (via 426) for multiple possible configurations up or down. Though I will mention that there are a few spectacular breakout views and of course, wildflowers when the time is right. 54 is a sprawling behemoth of a road with two distinctly personalities. 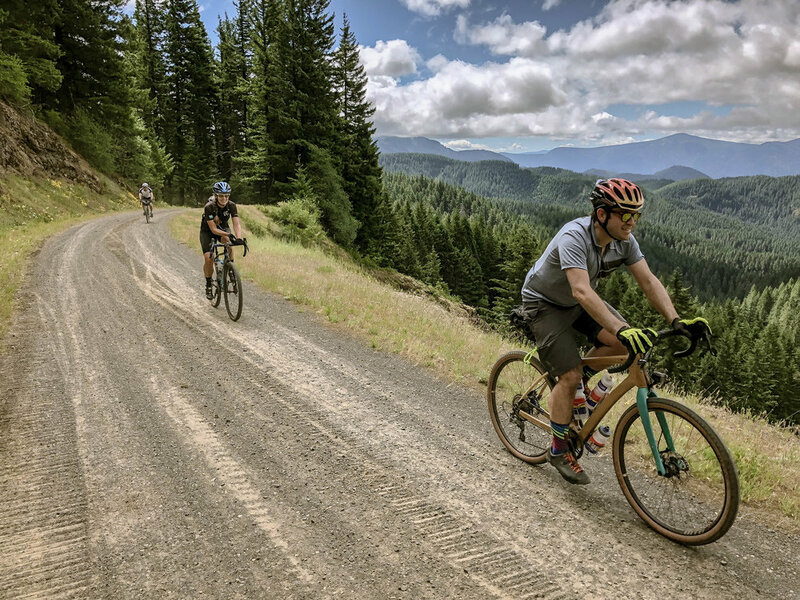 The western leg is a monster 16 mile gravel climb starting at Calamity Peak road and connecting to lower 37 near Canyon Creek, running parallel to 37, one ridge to the north. 54 ascends over 3000ft to the Soda Peaks trailhead before switching over to pavement. The eastern/southern slope is quite possibly the best paved descent in the entire Gifford, dropping 2700 over ten miles of perfectly banked, pitched pristine low-traffic forest tarmac. 54 terminates into Little Soda Springs/Szydlo road providing easy access to Wind River Highway, Carson-Guler Road and Warren Gap among others. One thing to note is that the far west end of 54 has a massive washout, like 37, making it impassible to vehicles, so this section will feel quite a bit more wild. Warren Gap is mainly just a useful way to directly connect Wind River Highway to Panther Creek/NF65. 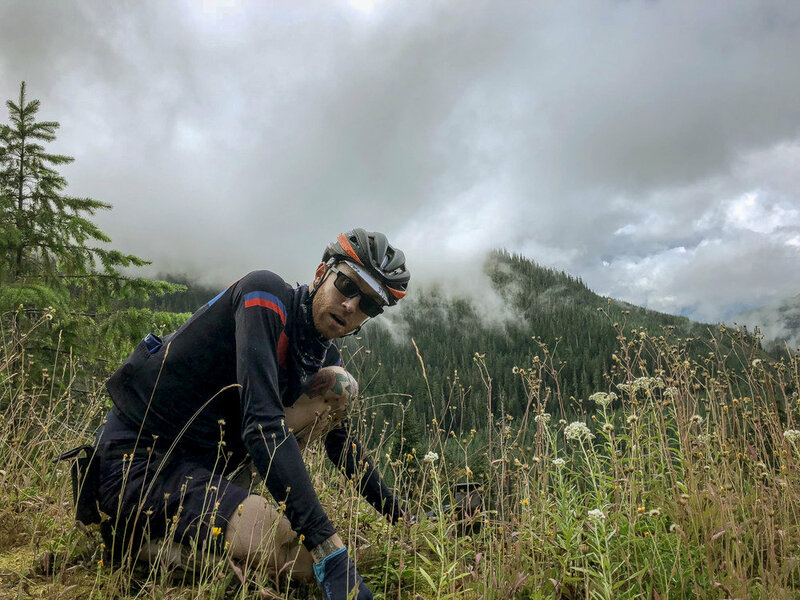 It is shady, lush, smooth, convenient and upholds our theory that crossing or riding near the PCT is almost always an indicator that the riding is going to be pretty damn sweet! NF60 is a major arterial connecting the Wind River corridor near Stabler to the ‘four corners’ intersection w/ 65/Panther Creek, Goose Lake, the Guler Ice Caves and onward to Trout Lake. At the south end, 60 begins as a narrow, serpentine 10 mile paved road climb before turning to gravel around the ‘four corners’. Here it broadens into a fairly wide gravel road with moderate traffic in summertime high season, accessing several popular lakes, campgrounds and hiking areas. It transitions back to tarmac near Goose Lake, becoming WA 141 as it heads eastward into the community of Trout Lake. Think of Wind River as the southern mainline into the Gifford; the expressway straight into the belly of the beast; a sprawling multipede of adventure, the many legs of which forming gateways into the Gifford’s vascular networks of dirt and gravel forest roads and trail systems. The Wind River Highway/Road runs south-north (and vice-versa) from WA14 just outside of Carson to the intersection of Curly Creek and NF30 near the Swift Reservoir en route to Mt. St. Helens. Along the way it provides access to just about all significant areas in the southern-central Gifford Pinchot: Wind River Experimental Forest, Panther Creek, Government Mineral Springs, Falls Creek, Trout Creek, Big Hollow, Paradise Creek, Koshko, McClellan Meadows, Oldman Pass and beyond to Lone Butte and the Lewis River Trail.